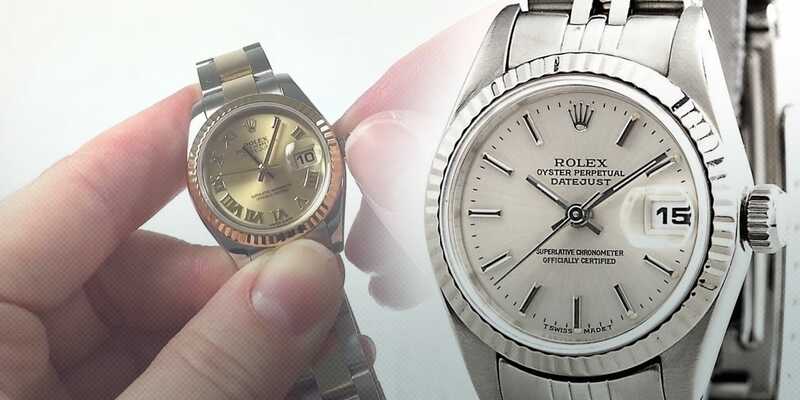 Winding a ladies Rolex wristwatch requires a little finesse but with these instructions, making adjustments can be done in a snap. This is a ladies two-tone Datejust reference number 69173. This is known as the Quickset model. I am going to show you how to wind your watch and set the time and date. Lets begin. Currently, this model is in its wearing position. Notice the crown is screwed in all the way insuring that the watch is water tight. What you will want to do first to wind the watch is to gently unscrew the crown counter clockwise to where it unthreads. Now in a clockwise motion, we are going to wind about 20-40 full turns. The reason why you would want to wind your watch if the watch has not been worn for a few days, or if you have just received it. This is necessary to insure that the watch will not stop on you and function properly. Now that we have wound the watch, we will want to set the date. We are going to pull the stem out, the crown, and set the correct date, today is the 2nd. And now we are going to take the crown out to its last position where we are going to set the time and it is now about 6:00 o’clock. Now we are going to push in and screw the crown all the day down so that it is secure and water tight. Now it is ready to wear and enjoy.